Two (2) AAA batteries (not included) are required to operate the electronic Light-&-Sound feature, and should be replaced by a responsible adult. In the not-too-distant future, Earth has opened its doors to the universe, and co-exists peacefully with most of the known worlds throughout the galaxy and the many alien species that inhabit them. But like here, there is also crime, and it exists in many forms. The Alienizer syndicate is one of the more powerful and influential crime organizations, and they fund terrorism and chaos as their business through various alien spies, arms dealers, smugglers, and other illegal & dangerous activities. There are also individual criminals out there who indulge themselves in various schemes, cons, and thefts. For those extraterrestrial beings who cannot co-exist peacefully on Earth, there is the special-investigation taskforce known as S.P.D. - Special Police DekaRanger [Detective Rangers]. This intergalactic police force, made up of dedicated humans and aliens, fights to defend the peace & freedom of Earth and its allies. Whenever an alien becomes a major threat to the city by growing to the size of a 15-storey building, or when the Alienizer is contacted & hired by a criminal to send down a giant robot as a distraction, the Earth-based S.P.D.- led by the commanding Doggie Krugger (a tall blue dog-like Anubinoid from the planet Anubis)- sends out the Patrol Machines from the giant DekaBase headquarters to the DekaRanger to combat the threat directly. The Pat Machines are five large police vehicles specifically designed for inner city, close-range, ground-based combat. Patrol Striker - this six-wheeled Pat Machine is piloted by DekaRed, and has two small manipulator arms that can be used for several purposes. It is the most flexible of the five Pat Machines because it can mount several weapons on itself for independent attacks- including the Judgment Sword and GyroWrappers. Patrol Striker forms the head, torso, and upper legs of the DekaRanger Robo. Patrol Gyro - this flying Pat Machine is piloted by DekaBlue, and is the muscle of the five. In addition to being the only one that can fly, it can also fire large Gattling cannon rounds from its two large jet turbofan engines, and has a lifting hook for crane operations. Patrol Gyro forms the left leg & foot of the DekaRanger Robo. Patrol Trailer - this long eighteen-wheeler Pat Machine is piloted by DekaGreen, and acts as a support vehicle for the others. While not quite as agile as the other five due to its length, it stores the Signal Cannon and part of the Judgment Sword in its trailer. Patrol Trailer forms the right leg & foot of the DekaRanger Robo. Patrol Armor - this defensive Pat Machine is piloted by DekaYellow, and features no weapons of its own. Instead, it is designed as an armored decoy, and as such can navigate many terrains, including moving across water like a hovercraft to carry out that task. Patrol Armor forms the right arm of the DekaRanger Robo. Patrol Signal - this support Pat Machine is piloted by DekaPink, and handles emergency public evacuation tasks, such as directing traffic away from the battle zone. Without weapons or heavy armor, it depends on its four large balloon-like wheels to sprint around and get where it needs to quickly. Patrol Signal forms the left arm of the DekaRanger Robo. In addition to the different features each Pat Machine has, the Patrol Striker carries the light-&-sound feature of the toy. By turning on the switch under the nose of the toy, several light/sound combos can be used. When the "1" on the top is pressed, sirens sound and the red LED police lights flash. Another first for this set is the addition of a new electronic movement sensor inside the Patrol Striker, which is sensitive to bumps it receives either from the front/back or sides. Transformation is very simple, and requires little time to learn. There are one or two little things that can trip you up the first few times- like the latches & cover on the bottom of the Patrol Striker, the nose & jet turbofans of the Patrol Gyro, or the spotlight handle on the Patrol Armor- but they're not going to disrupt things too much. Also, when the batteries are turned on during the transformation, the shock sensor detects the little bumps from snapping things together, and makes appropriate metallic clicking sounds & light patterns. This set also brings back the rare hidden electronic button- something not seen since the introduction of the DX Galaxy Mega, from "Denji Sentai MegaRanger" (1997). 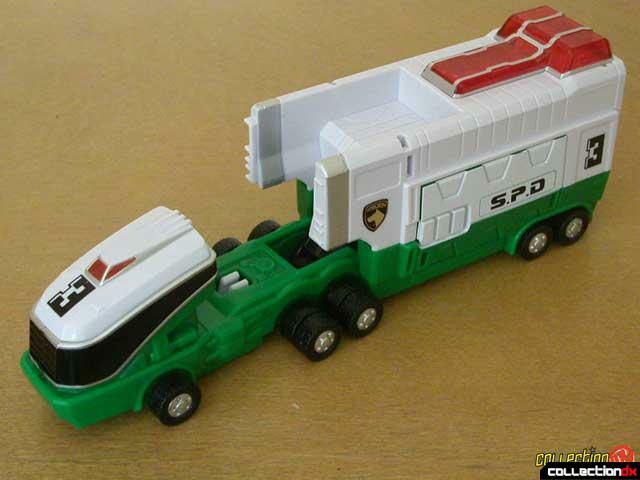 When the battery is on, and the two halves of the Patrol Striker are separated and then snapped together again, the hidden button lets the toy know that the change has occurred, and this activates a completely different set of light-&-sound patterns that are used for the combination. I've come to think of the DekaRanger Robo as the Sentai equivalent of the non-transforming lead AV-98 Ingram-type police mecha from the anime series "Mobile Police Patlabor"; with the red strobe lights, the white & black armor, and the weapons & special features hidden throughout the body. The DekaRanger Robo is a compact and efficient design which doesn't have all of the glamour of previous lead mecha from other Sentai shows. Even the head has something of a real life police look to it, incorporating a small clear blue plastic visor to shield the eyes of the mecha, and a small microphone over the mouth. As with the separate Pat Machines, the DekaRanger Robo can take almost full advantage of their special features. It can access its primary ranged weapon, the Signal Cannon, from the sliding compartment built into the right leg (Patrol Trailer). With it, the DekaRanger Robo can perform several attacking maneuvers, including a jump-&-fire, a drop-roll-&-fire, and the finishing attack- the Justice Flasher. The Signal Cannon also has a few secondary options which allow it to shoot crime scene-like tape to wrap up its opponents, or shoot water to douse flames. The Judgment Sword actually is composed of the spotlights from the right arm (Patrol Armor) and the blade from the sliding compartment in the right leg (Patrol Trailer). While it's a little flimsy in its toy form, the sword is used more like a police baton in the show. The other hand-held weapon isn't really a weapon- the GyroWrappers, which is composed of two rings stored under the jet turbofans on the Patrol Gyro. Basically a giant pair of blue handcuffs, they can restrain or even shrink back down opponents. Just as the DekaRanger have their SP Licenses to find the guilt or innocence of a suspect, so too does their giant mecha have a Judgment Scanner, though this is built into the left arm (Patrol Signal). Unfortunately, this feature doesn't work quite the way it does on the show. As mentioned earlier, the hidden button activates a completely different set of light-&-sound combinations. This change also alters the shock sensor's reaction. 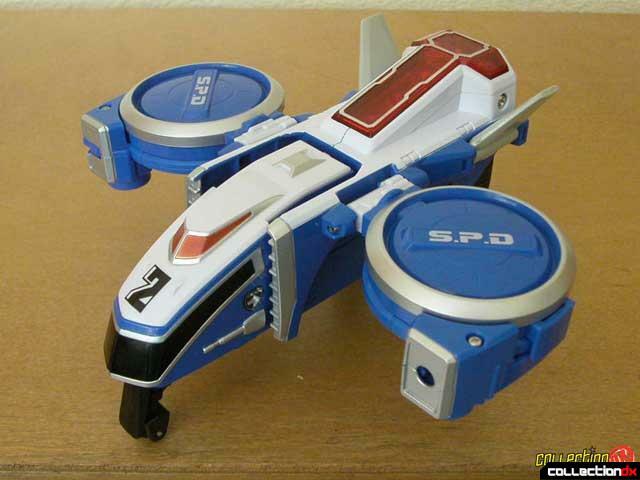 Instead of the revving engine sound when the Patrol Striker was bumped, we got a metal clashing sound with the combined DekaRanger Robo; bringing the grand total of light/sound combo effects to 6 for this toy. Pretty impressive since the most we've had before was 2-3 per toy. In addition to having the light & sound, Bandai went a step further to improve the comparison between the toy and the robot on the show. When the upper legs rotate out of the Patrol Striker, there are four red LED lights there, and then they are inserted into the Patrol Gyro & Patrol Trailer. This way, not only do the chest & shoulders light up, but the front of the lower legs do as well! As a final touch, if the battery is left on but isn't used for more than 30 seconds, the toy beeps & lights-up to get your attention, then repeats this same pattern after every 10 seconds until you either make it do something or turn it off. Very clever ideas! 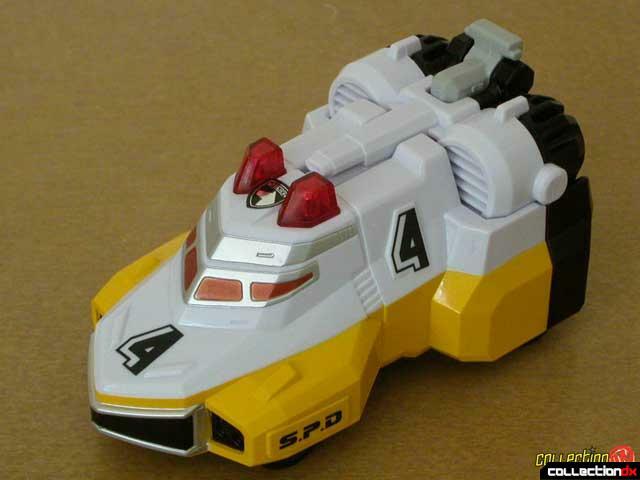 All of the "S.P.D" badges were painted onto the separate Delta Runners; there are no stick-on decals on the Delta Squad Megazord. Delta Runner-1 (Patrol Striker) and Delta Runner-2 (Patrol Gyro) are the only vehicles to receive silver paint, and even then not all areas were covered. All of the others get their regular paint, but no silver. The hubcaps on all of the Delta Runners remain their natural black plastic color. 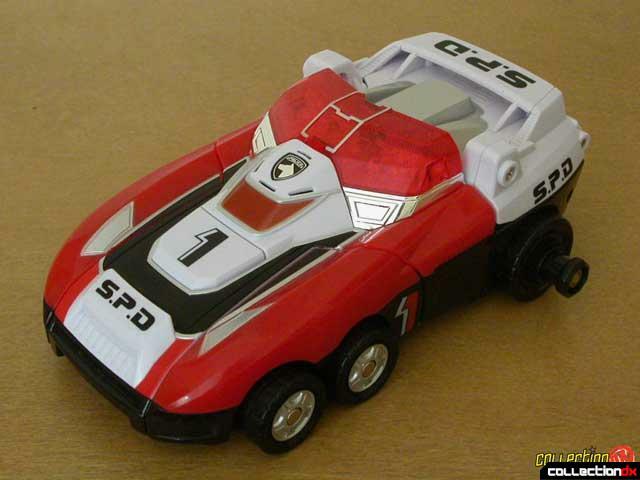 All of the "S.P.D" labels, which were painted onto the Japanese version have been left intact except for on the sides of Delta Runner-1. 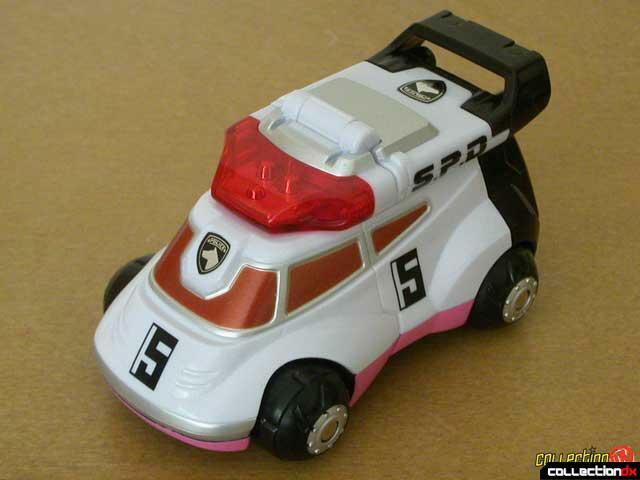 The two little black "S.P.D" labels on the white antenna of the DekaRanger Robo's head were removed. The numbered labels on the sides of each Delta Runner were removed, but the numbers on the nose of each Delta Runners remains. The light blue clear plastic visor on the DekaRanger Robo was replaced with a plain clear plastic version. Four LEDs (one per leg, one per shoulder) were removed, bringing the total to only seven, as opposed to the DekaRanger Robo's eleven. On the shoulders, the inside of the red plastic was remolded to cover for this on the Delta Squad Megazord. The silver-plated ABS plastic under the red lights on the DekaRanger Robo was replaced with a silver-painted equivalent. This led to the Delta Squad Megazord's chest lights not having as much reflection as its Japanese counterpart's. The silver-plated plastic inside the red plastic covers on the Patrol Armor and Patrol Signal was replaced with plain white plastic. All light-&-sound patterns are the same, as are all moldings. I think the DekaRanger Robo is a nice break from the craziness of the last three years. It doesn't have the glamour or flexibility, or even the graceful curves of some of the previous mecha, and you don't need to have tons of separate weapons & robots to see its full potential. It's a big, bulky, even awkward, design. But at the same time, it keeps you involved with its own special features. The shock sensor was a very interesting design, as were the leg-mounted LEDs, and all the internally-built accessories. Overall, the DekaRanger Robo is a good design, but not a great design. For example, the left leg is very distorted compared to the right, and the transformation is fairly simple. My only complaints might be that the arms didn't have a pop-out forward-rotating elbow, the extra cardboard signs for the Patrol Signal couldn't have been hidden somewhere inside the toy, the rotating angle of Patrol Trailer along the mid section could have been increased a little more, or that it was a little squat and could have profited from having the upper legs reach a little further than they did. But I won't hold that against it. It's still a good toy. Recommendation: if you don't care about the lost LEDs, paint details, & cardboard signs, go for the Deluxe Delta Squad Megazord; it's close enough. But, as always, take preference on the DX Tokusou Gattai DekaRanger Robo. It can stand on its own! If you want to learn about the Deluxe Delta Squad Megazord, please read Joshua Bernard's review, also located on CollectionDX! thanks for this nice review, since i'm (always) referencing to this site whenever i purchase a sentai DXs. I have two Pat stikers (red deka patrol striker) one from the Whole DX set (asia exclusive/japan) and one i just recently bought from Ebay (which is an individual or separate kit which only includes the Red mecha). They are very much the same (molding and design) and are part of the DEKAROBO DX. 1. LED, the red pat striker from the whole set has 11 . but the individual kit has 9 (it has one on each shoulder/ above the chest, 3 on the chest, and 2 on each leg. 2. the visor (from the whole set DX) is clear white (note this is not American release), but the individual patstrker red kit is bluish. 3. the trademark and year of production labeling on the bottom of the Red Patstriker. Hark- someone finally commented on this toy! Yes, I've found that the Bandai Asia (releases specifically for outside of Japan) and Bandai America adaptations are often the same when it comes to the DX sets. The changes you mention here are all the same as were made to Delta Runner-1 for the Dlx. Delta Squad Megazord. This simplicity and clarity of design would be welcome nowadays. I really love this mecha, its very simple yet can really stand on its own. its like it brought the "vintage" feel of the former sentai mechas and spicin it up with the color choice and electronics.